Google has deepened the integration between its Google+ social network and Gmail, adding a feature that auto-suggests Google+ contacts when Gmail users are typing in email recipients. In other words, you can email any of your Google+ contacts without knowing their email address, and they can email you as well. The feature will be rolled out over the coming days to all Gmail users who also have Google+ profiles. Gmail will auto-suggest Google+ users that the email sender has added to his Circles on the social network. (Circles is the term Google uses for connections on Google+.) However, email senders will not see the email address of the Google+ contact being auto-suggested unless the contact responds to the message, and messages from Google+ users that aren't also in your own Circles will appear in your Gmail account's Social tab, rather than the Primary tab. 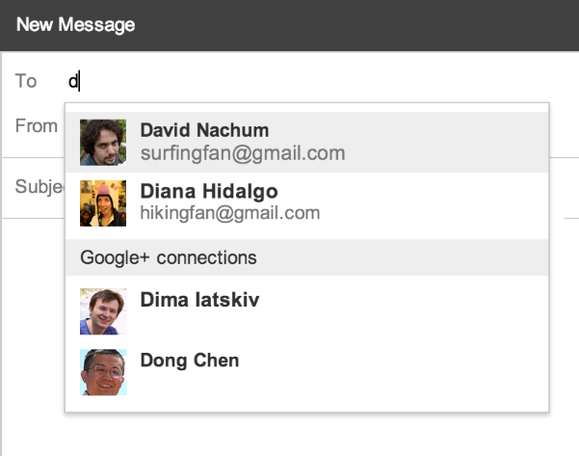 Google+ users are able to control who can contact them from Gmail in this way with four options. They can opt out entirely, so that they won’t appear in Gmail auto-suggest. They can limit the feature to include only people they have added to their own Circles. They can make the scope broader by extending it to people with a second degree of Circles separation, meaning people you’re not connected to but who are connected to someone in your Circles. The last option is to open up the feature to anyone on Google+. The goal of this new feature is to make it easier for Google+ users to communicate via Gmail. Google says the feature will be rolling out over the next few days. Google has said repeatedly that its intention is to integrate Google+ broadly and deeply with its other services, sites and web applications, so that it can act as a common, underlying social networking layer. Google has integrated Google+ with Gmail, Blogger, Apps, YouTube and other products to varying degrees already. PCWorld senior writer Brad Chacos contributed to this report.